Order your Steinberg Hardware License Key from AMS and enjoy Fast & Free Shipping. Get the Best Deal with our Lowest Price Guarantee & Great Customer Service! The Steinberg Key unlocks Steinberg's world of professional audio tools. Required to run any of Steinberg’s new VST instruments released after 1st January 2005, Steinberg Key also offers additional movies and PDF documents on CD-ROM that provide in-depth information for further research on Steinberg products. Steinberg Key also enables users to run full featured demos of Steinberg applications. The Steinberg Key is the key to Steinberg's world of professional audio tools. The purchase of this license key is required to run any of the new Steinberg VST instruments released after 1st January 2005, as these products will not contain a USB hardware protection device. Users already using a “USB dongle”-protected Steinberg product are not required to purchase an extra key. 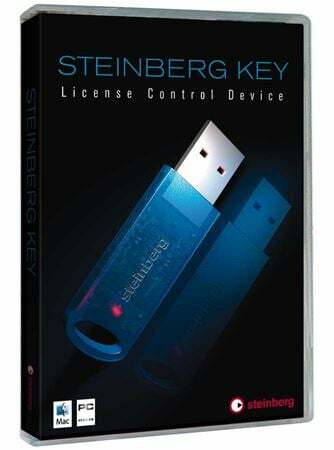 The license modules are offered in a DVD package containing the key and a CD-ROM with movies and information about current Steinberg products. Additional PDF documents provide in-depth information for further research on Steinberg's leading applications. Steinberg Key also enables users to run additional full featured demo versions of the applications that are included with every Steinberg product package. The demo versions offer a hands-on experience with Steinberg's leading applications and instruments. Its a key you need one so get 2!